Note, in the following article, from The New York Fake News Times, how hard they are pushing the false narrative that the rally was a white supremacist event. 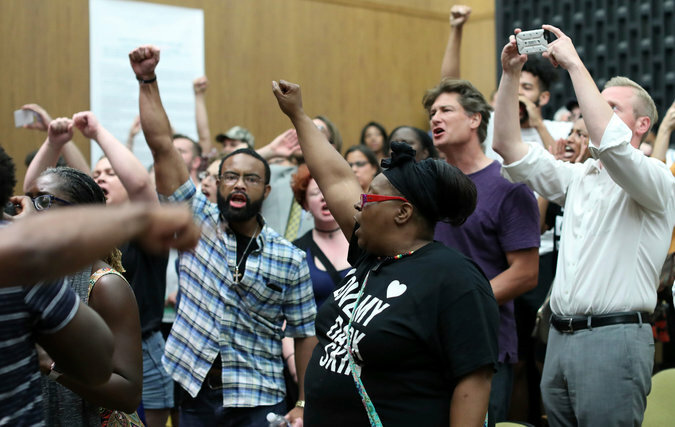 From The New York Times (CHARLOTTESVILLE, Va.) — They shouted down the mayor and City Council members, took over the Council chambers for about a half-hour, and gave more than four hours of impassioned testimony about how city officials had botched the response to the deadly white supremacist rally here this month. In the end, the angry residents who spoke at the Charlottesville City Council meeting on Monday got some measure of action as officials said they would have a third-party review the city’s planning and reaction to the rally. The Council also voted unanimously to take the first administrative steps to remove a statue of the Confederate general Stonewall Jackson in the city. That move was significant, as it was the Council’s decision earlier this year to remove a statue of Robert E. Lee that prompted the white nationalists to rally in the city earlier this month. Monday’s meeting was the Council’s first since the rallies on Aug. 11 and 12 that brought hundreds of white supremacists to Charlottesville. White and black residents alike were furious with the police response to the demonstrations, and they faulted officers for not engaging during repeated scuffles. A woman, Heather D. Heyer, was killed when a man drove into counterprotesters. The meeting started out without incident, but as soon as the rally was mentioned, several residents began shouting down city officials for allowing the Aug. 12 “Unite the Right” rally to take place. The chamber erupted, and when police officers forcibly removed three people, the 100 or so at the meeting broke out into furious chants of “Shame” and “Shut it down!” The three people were issued summonses charging them with disorderly conduct. No injuries were reported. 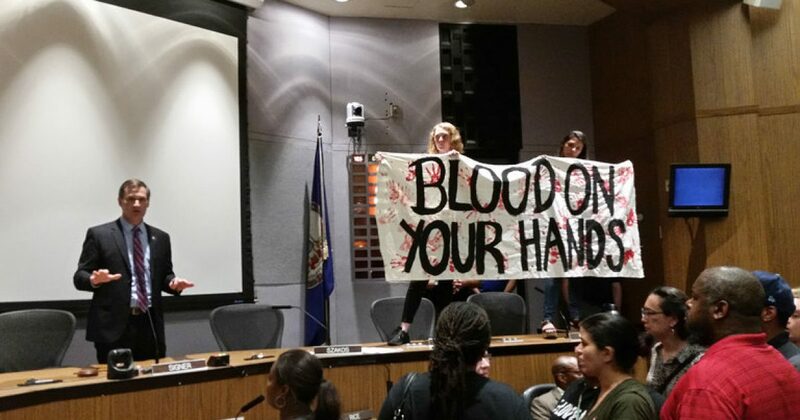 At one point, two people stood on the dais and unfurled a banner with the words “Blood on your hands!” as council members and the mayor left the room. The residents refused to cede control of the room until the authorities promised to release the residents who had been taken away and let people have their say. Vice Mayor Wes Bellamy, the only African-American on the Council, was the sole member who remained. He negotiated with residents to restore order in exchange for scrapping the meeting’s regular agenda and giving each person one minute to speak. It took about a half-hour for order to be restored, and the meeting stretched for several hours, as speaker after speaker spoke about their anguish over what the community had experienced. Several people wept and said they had been unable to sleep since witnessing violence against their neighbors. “I’m not the same person I was that day,” said Paul Hurdle, who shook as he described the mayhem on Aug. 12. Gail Weatherall, who said she had lived in Charlottesville for 35 years, called for a citizen-led review of the events and the city’s response. Several speakers criticized the Council members for not having heeded warnings to avoid the protest, and promised to vote them out of office. But city officials stressed that they had tried to deny the white supremacist rally a permit, but that a federal court had ruled in favor of the protest organizers. His account was met with jeers, and the shouting continued. Mr. Signer took the brunt of the community’s ire, as many people demanded his resignation. Responding to residents’ concerns, Maurice Jones, the city manager, said Charlottesville would have a third party review the city’s response to the white supremacists’ gathering. He urged residents to submit specific complaints of serious incidents to the police chief. Afterward, the City Council voted unanimously to drape the statues of Robert E. Lee and Stonewall Jackson in black in mourning.